Our car hood covers are manufactured from a stretchy, polyester/spandex blend fabric with a durable elastic band carefully sewn-in around the edge so that the hood cover can be slipped onto the hood of almost any car and vibrantly display the message of your choice. The dimensions of our hood covers have been chosen to fit the hoods of most makes and models of vehicles. 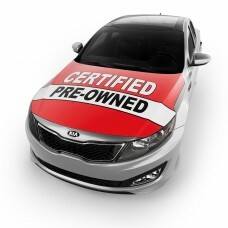 We offer popular designs which are an excellent promotional item for car dealerships to promote Certified Pre-Owned Vehicles and Sales and to wish customers a Happy Holidays or a Merry Christmas. Our hood covers offer an advantage over other forms of advertising including flags and windshield signs because they do not need to be removed during the test drive, allowing your sales staff to focus on selling vehicles rather than wasting time removing unwanted stickers or flags from the vehicle. Our holiday-themed hood covers are the best-selling designs in this product line. 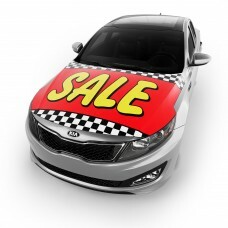 Car dealerships often use them in conjunction with car bows to decorate their showroom with a festive theme for the holiday season. 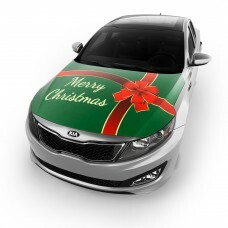 In addition to their use as a promotional item for car dealerships, our Happy Holidays and Merry Christmas hood covers are a popular choice for individual consumers who are looking to spread holiday cheer during holiday season.